Hong Kong's first crowdfunding campaign for a London Fashion Week show! Dare to be Feminine and Romantic --- multi-award winning fashion designer Chailie Ho will be launching her international debut show on the London Fashion Week runway next year. With her FringeBacker campaign, she is engaging you all to be on her side when she displays her work to an international runway. And, as she put it, this is "quite a journey that's filled with the art and fashion of beauty and romanticism". Support her now on FringeBacker! 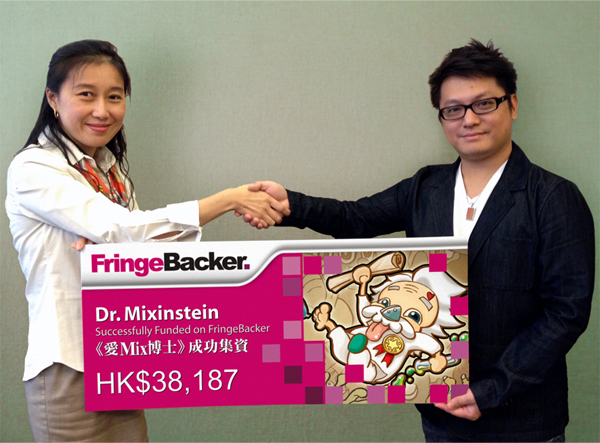 Dr Mixinstein by Fingerprint Studio, the first home-grown Hong Kong mobile game to successfully crowdfund, raised over HK$38,000 (127% overfunded) on FringeBacker. Their tremendous success will inspire a string of IT and game developers to seek funding directly from their audience. At a time when there is a high degree of financial risk inherent in developing and producing a game, where production costs are high, and young developers are making their first entry into this creative/IT industry, FringeBacker offers a multimedia and bilingual crowdfunding platform that empowers developers to access the funds that they need for their business development from the public, while offering supporters and fans become a part of the games they love. FringerPrint Studio, chaired by Dixon Cheung, has set out to lead the mobile gaming community in Hong Kong, and to encourage the wider public to get involved with the industry. The studio is reaching high for bigger goals, and hopes to revolutionise the industry. They have benefited from the visionary leadership of Dr. John Lo of Hong Kong Design Centre and InnoCentre, where Fingerprint has been selected to be an incubatee of their “Design Incubation Programme”, which provides financial grants, support and adequate facilities to nurture young talent, and offers opportunities for them to pursue their creative projects. FringeBacker held its Crowdfunding for Designers workshop for InnoCentre incubatees last year, organised by Hong Kong Science & Technology Parks and Hong Kong Design Centre. Dr Mixinstein will no doubt spark a crowdfunding trend for many other game and IT developers. All eyes are now eagerly awaiting the Good Doctor!